I was browsing the Ubuntu Forums today and someone asked “How can I export my playlists from RhythmBox?”, how easy must that be I thought. I was wrong. I had a look under the “music” menu thinking there would be an export option and there wasn’t. Here’s the options I got under the playlist menu. …Wrong! I was beginning to think it wasn’t possible. I spent ages searching for a solution on the net, I even tried finding out where Rhythmbox had put the playlists in the file system so I could maybe grab them from there. No luck. Then I had an idea. This is what happens when you select a playlist in the right hand column and then go to the “Music / Playlist” menu again. Hallelujah!! The “save to file” option magically appears. It shouldn’t be this hard to find the function though, there should be an option on the context menu at least and probably an export option on the main “music” menu, which then allows you to choose a playlist to export after you click it. Hopefully the Rhythmbox developers will make this feature a bit more intuitive in the future. I still love Rhythmbox though don’t get me wrong, I just thought I’d post my solution in case anyone else gets caught out by this like I did. Good job sorting this out! 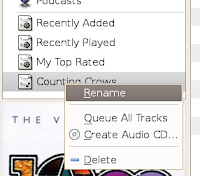 Rhythmbox doesn’t seem to offer the same menu item when selecting one’s internet radio feeds for export. Have you had any luck exporting internet radio station lists to m3u files? No I can’t say that I have sorry. I don’t really use the internet radio streams and I don’t use Rhythmbox to aggregate podcasts either because it started downloading half a file on me and playing up. Your rhythmbox data files are stored in ./gnome2/rhythmbox/ at least on ubuntu. Data is in XML format, but I was able to open it usefully in a browser window. I’m sure there are XML data editing tools, and I understand SGML tools might work too. EMACS, anyone? They could have shown the option to save the playlist disabled if there was no playlist selected. Would be much easier to figure out. does does the new saved folder have an additional copy of the music files? I don’t want to reroute the files. I am hoping to create a folder on a thumb drive to give to a friend for the files. It’s been 6 and a half years since I wrote this so it’s hard to remember. I think it just a playlist file it exports not all the files. To be honest, Rhythmbox has changed so much in 6 years I don’t even know if the advice is still relevant. I would say try Banshee if you want a more modern player with more features.